We get a lot of drain cleaning calls in Longwood Fl and most of the time the customers do not know if they are on city sewer or septic. This is not good because if you are on septic it should be pumped out every two to three years and if you do not know if you are on city or septic chances are you never had it pumped and cleaned out. Some of the ways you can tell if you are on city sewer is looking at your Longwood Fl water bill. If you are on septic you will be charged for water only, no sewer charges will be on the bill. Another good way to tell if you are on city sewer or septic is to look in your street. 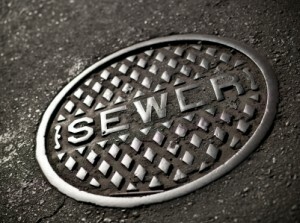 If you see manholes in the road or in the grass that say sanitary on it then you are on city sewer. Your Longwood plumber needs to know this because if it is septic and you have not ever had it pumped then most likely that is the cause of your drain clog and if not, then your plumber should be able to clear your drain line. Knowing this info upfront will save you money. If you are on city sewer and have a back up give Drain Genie Plumbing Services a call at 407-588-1736. We serve Longwood and these surrounding cities Orlando, Deltona, Lake Mary, Oviedo, Sanford, Winter Park, Apopka, Casselberry, Winter Springs, Altamonte Springs, Maitland and all of Central Florida.